The tilt-bed truck delivers containers up to 24’ long or a combination thereof (i.e: 2 x 10’ containers). This is the smallest truck in our delivery fleet and has the tightest turning radius. It is suited for inner-city deliveries, mountain roads, and limited access sites. 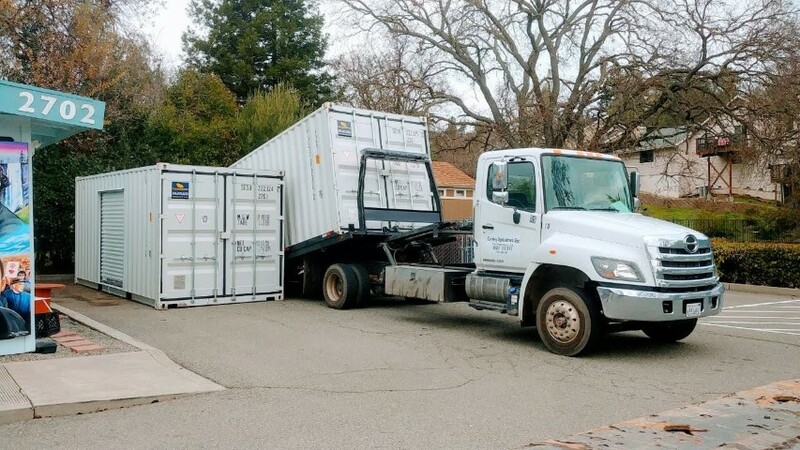 This truck is backed up to where you want the container placed; the bed is titled and the container is rolled off the back of the truck into position. This truck requires at least 60-feet of straight line clearance to safely complete this delivery. When placing your order, we will ask whether you want the container loaded with the doors facing the cab or the rear of the truck as this determines the final door placement at the site after delivery. Please let us know if there are clearance concerns at the site or en route to the site. We will be happy to preview the route before delivery. Rental storage containers 24’ and smaller are delivered and picked-up using these trucks. The tilt-bed truck and trailer combo can deliver containers up to 45’ in length or a combination thereof (i.e: 2 x 20’ containers, 4 x 10’ containers). This truck requires 100-feet of straight line clearance to complete the delivery. First, the truck is backed up to where you want the container placed. Next, the trailer is titled and then, the container is rolled off the back of the trailer. When booking your order delivery, we'll ask whether the container is to be loaded with the doors facing the cab or the rear of the truck. This positioning determines the final door placement at the delivery site. Please let us know if there are any clearance concerns at the site or en route to the site. We will be happy to preview the route before delivery to confirm the delivery can be completed. Our 40’ standard, 40’ high cube, 45’ high cube, or 2 x 20’ rental storage containers are delivered and picked-up on these trucks. The flat-bed truck delivers containers up to 45’ in length. Unlike the tilt-bed truck option, we are not able to place containers on the ground. A forklift, crane, or other offloading equipment is required at the site to complete delivery. Generally, this delivery truck option is selected if your delivery location is more than 200 miles from the location of one of our yards. Please let us know if there are any clearance concerns at the site or en route to the site. We will be happy to preview the route before delivery to confirm the delivery can be completed. The side-lifter truck uses 2 sliding cranes mounted towards the front and the rear of the trailer to place the container on the ground or lift the container onto the trailer. This truck delivers containers from 20’ - 45’ in length or two 20 ft containers, provided that all containers have 4 bottom ISO corner castings. The side-lifter truck is the largest truck in our delivery fleet. The main advantage of the side-lifter truck is its load capacity of 42,000 lbs. This truck easily transfers containers from other trailers or chassis at your site, managing a load capacity of up to 72,000 lbs. Provided a solid level surface is available on-site, The side-lifter truck can stack containers up to 2 levels high. To achieve this, the driver positions the truck adjacent to where the container is to be placed. Next, the outriggers are set, and then the container is offloaded or loaded from the driver’s side only. When booking your order delivery, we'll ask whether the container is to be loaded with the doors facing the cab or the rear of the truck. This positioning determines the final door placement at the delivery site. The side-lifter truck is more expensive than the tilt-bed truck delivery option because it does not require a 100-feet straight line clearance to complete the delivery. Further, a side-lifter truck is used if the container needs to be set on an elevated platform or stacked on top of another container. The crane truck delivers containers up to 24’ in length or a combination thereof. This truck can also pull a trailer if multiple 20’ (or smaller) containers are to be delivered to the same location. A crane is mounted between the cab and the deck to load and offload containers. Under standard circumstances, the crane can place a 20’ container about 25’ away from the truck. This truck is operated by a certified crane operator. The crane truck is a great delivery option if the container needs to be placed over a fence, on an elevated platform, stacked on top of another container, or if precision placement is of utmost importance. Please note, the feasibility of every delivery placement is assessed on a case by case basis. To prepare your site for delivery, your shipping container should be placed on firm, dry, level ground, i.e. pavement, gravel, or hard dirt. The tilt-bed and flat-bed truck deliveries are quoted a flat rate that includes 30 minutes of offloading time. If the site is not ready to receive delivery, equipment is not prepared, or etc., and additional time is required, an hourly rate per our terms & conditions will be charged in 15 minute increments. The side-lifter and crane truck deliveries are generally billed at an hourly rate, beginning when the driver leaves our yard and concluding when the driver returns to our yard. For all deliveries, our dispatcher will call the site contact 24 hours in advance to confirm the 2-hour delivery window. The day of delivery, the truck driver will be call the site contact with a 30-minute delivery window. Terms & conditions apply to all deliveries.